Bobble stitch, puff stitch or popcorn stitch, whatever you want to call it, we’re big fans of fun stitches with lots of relief. This is also a fun stitch to use to make a cover for your iPad because the bobbles will give it added protection if it falls. The ladies of NUÏ explain how to make one. chain stitch: yarn over your crochet hook. Pull the thread through the loop. double crochet: stick your hook through a stitch, yarn over your hook and pull the hook back through the stitch. You now have two loops on your hook. Yarn over the crochet hook and pull the yarn around your hook through the two loops. treble crochet: yarn over your crochet hook and stick it through the next stitch. Yarn over the crochet hook and bring it through the loop. You now have three loops on your hook. Yarn over the crochet hook again and pull it through the first two loops on the crochet hook. You now have two loops on your hook. Yarn over the crochet hook again and bring it through the two loops. You crochet this stitch on top of double crochet stitches. A bobble consists of 5 treble crochets that are all worked into the same stitch. • 1st bobble in the row: chain 3 (this is your first ‘treble crochet’). Then treble crochet 4 in the fourth stitch: *yarn over your hook, stick the hook through the fourth stitch, yarn over again and pull the hook back through the stitch. You now have three loops on your hook. Yarn over the crochet hook again and bring it through the next two loops. There are two loops left on your hook. * Repeat the instructions between the asterisks three more times. You now have five loops on your hook. Yarn over the crochet hook and bring it through the 5 loops. Your first bobble is finished! • after each bobble, double crochet 1 in the next stitch. • for each remaining bobble: treble crochet 5 together in the next stitch as described above between the asterisks. Yarn over the crochet hook and bring it through the 5 loops. 1. Make a slip knot. This is your first stitch. 2. Row 1: chain 30.
to work a double crochet. Finish this entire row with a double crochet stitch. 4. Row 3: work 13 bobbles according to the instructions above. Finish the row with a bobble. 5. Row 4: double crochet an entire row. 6. Rows 5-13: turn your piece each time and crochet as described for rows 3 and 4. 1. This is the point at which the back starts. Chain 2 to start each row and then double crochet until the end of the row. 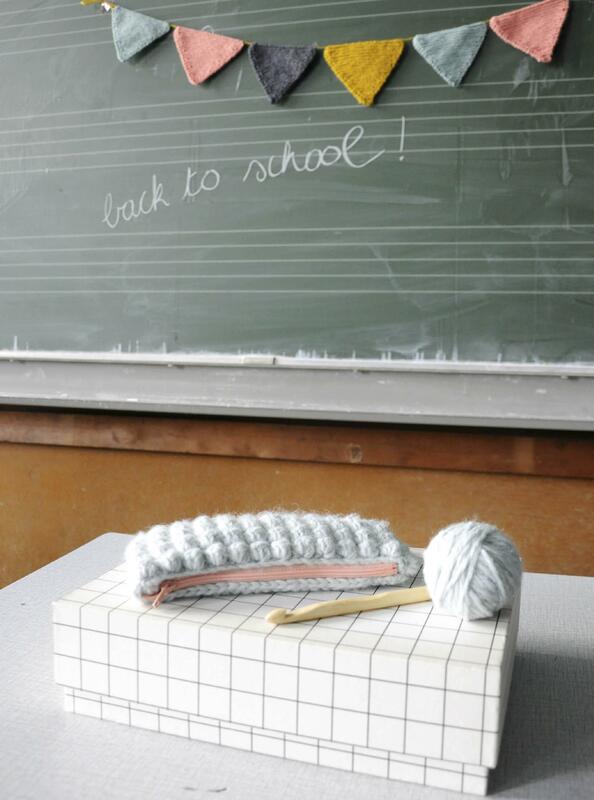 Work as many rows as you need to create the back of your pencil case. 1. Turn the case inside out and sew the sides to each other using a darning needle. 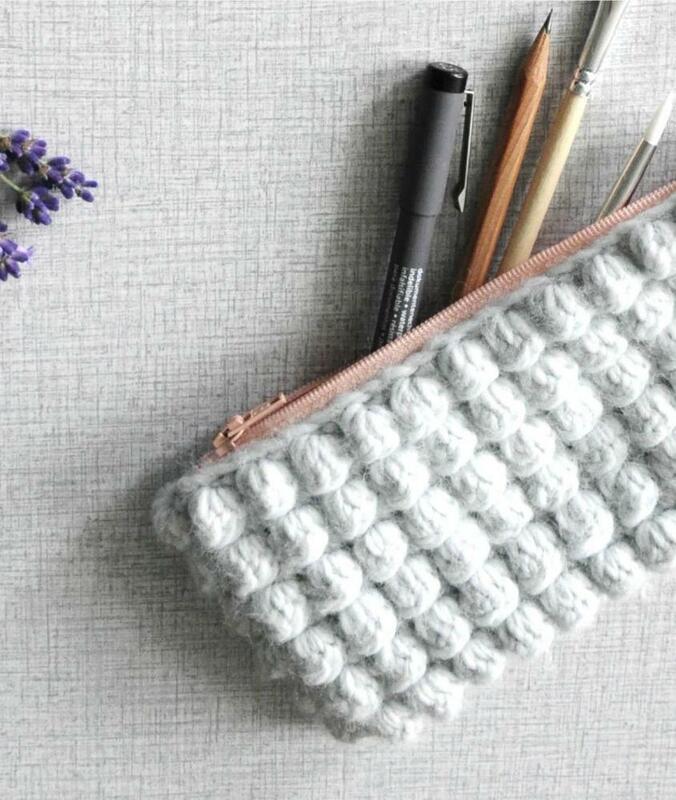 Use the same yarn for this that you used to crochet your case. 2. Reverse the case again and now sew the zipper to the case by hand using silk thread and a thin needle. You can find NUÏ on Instagram and Facebook.